Oh oh. On last Sunday we went to attack Peh Ge's room after dinner.YouTube-ed and read blogs. Showed the others the vid of Peh Ge's ballet performance during prom. MUAHAHA. Besides, we watched Cindy a.k.a. Xuan Lin's choir performance. 1st runner up for NATIONAL level!!!!! OMG how I wish I was in that team, guided by Xuan Lin i.e. the best conductor in Selangor for the year of.. 2007? Another perfect girl, lar. We too took the oppurtunity to look at photos. After this 2 weeks of “introducing my old friends to my new friends”, I could therefore made some conclusion. 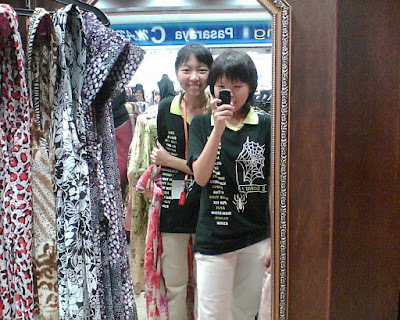 Ying Sze, the girl with a twin sister (Merdeka baby somemore!) said that Julia is pretty and Mandy is very cute. Hui Yi said Sheen Yeen is very “si wen” (What is that in English again? Soft and polite?) when she saw her on webcam. Sheen Yeen? Si wen? Imagine that, people. Lol. I realised I couldn't study in my room, especially at night BECAUSE there are SO MANY VARIETY OF INSECTS FLYING EVERYWHERE. This is truly insane. Imagine sitting down, opening a book, and insects with different colours and size come landing on your book once in every 5 seconds. Seriously gonna become mad in no time. Gah. This is a bit of exaggaration BUT it is true that there are many insects that I have not been meeting in KK before. Gah! Additionally, can you imagine that, the RED ANTS actually attacked my PADLOCK? The secret-code type of lock. As I was turning the numbers, the ants(SSSSSS) came scuttling out from the tiny space onto my hand. OMG OMG OMG. I think I should speak English more frequently for the sake of MUET. LOL. Even though it would be weird to speak English with my friends like.. PEH GE! Changing the medium of communication after 9 years. WOW. I'm currently addicted to Gardenia's Butterscroth. =P It is gonna be my breakfast for 4 days. Make full use of the RM4.00 bread. Yay! The students for second intake has reported to the college on Monday and they look relatively....cool. Compared to us, the hyper first batch, which could greet anyone and talk to them for a long period of time without knowing their names. Haha! Just like the 6 of us (me, Peh Ge, Hui Yi, Xuan Ling, Ying Sze, Allana), who LOVE to talk so much, until 7.00-8.00pm became our “high-time” as we had our dinner while sharing gossips LOUDLY. Especially when it comes to one of us trying to make declaration, and the others trying hard not to let her have the oppurtunity. Perhaphs we were TOO LOUD until we scared off the students of 2nd intake. NYAHAHA. But fortunately we do knew some new friends, this time not all from Selangor. I got 2 new classmate in my tutorial class, one Indian and one Malay. The Indian girl, Harine is really friendly and we clicked almost immediately as we are equally BLUR. HAHA. Spent my thursday afternoon loitering around the school with her to accompany her to buy some stuffs. And, and, it is the Dumpling Day for us today (Friday)!! 9 of us went out to Changlun and had dumpling as lunch. But ouch, small dumpling had cost us RM3 per person. Yaiks. Yet, once in a year, I think it is OK. Besides, it was such a long time since I last ate a pork!!! Sounds so....weird, but, yea. We even watched Bride Wars in the big lecture hall just now. Just RM1 per person. Freaking cheap if you compare with a real cinema. LOL. Not some action movie, so the effect will be almost the same.